Now they’ve made the change to power, with a boat that gives them that same feel. It’s a 1984 Lord Nelson Victory Tug, which they bought in May 2014. 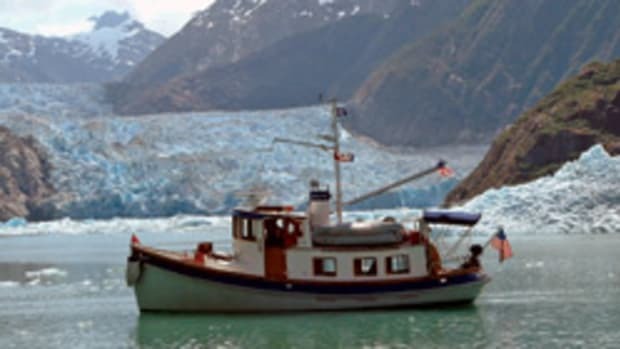 SPECIFICATIONS LOA: 36 feet, 11 inches BEAM: 13 feet, 2 inches DRAFT: 3 feet, 6 inches WEIGHT: 20,500 pounds HULL TYPE: displacement POWER: 150-hp diesel TANKAGE: 250 gallons fuel, 40 gallons water BUILDER: Lord Nelson Yachts, Seattle. 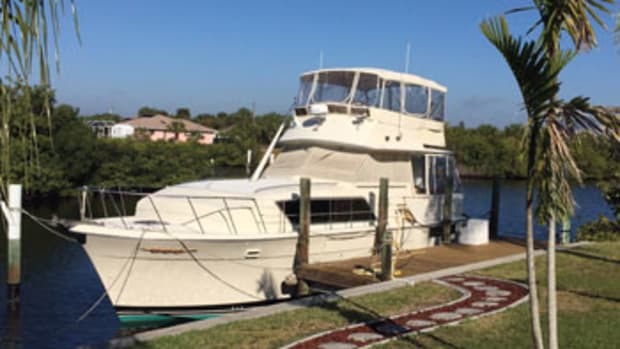 With three boating seasons under their belt, the Andersons say the salty 37-footer was the right choice. 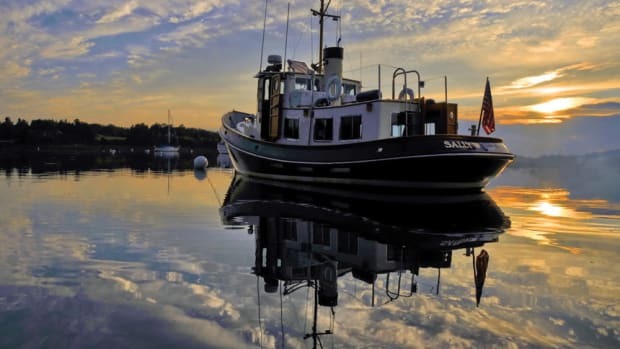 “With a boat that does trawler speed, the feeling is similar in that we both feel connected to the boat and to the water,” says Anderson, 66, a self-employed engineer from Owatonna, Minnesota. 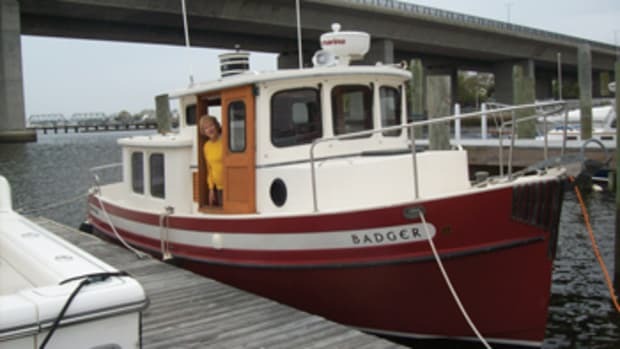 The 30-year-old tug was in excellent shape, cared for by a meticulous owner, Anderson says. The power plant was a BMW D150 turbocharged diesel. The 6-cylinder engine delivered 136 horses for a 7-knot cruise. 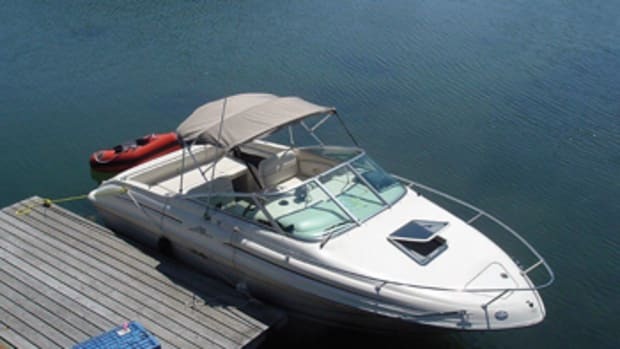 Electronics included a radio, radar, depth sounder and fuel-flow meter. The Andersons now have a longer voyage in mind. In 2019, the couple expect to move aboard and fulfill a dream by doing the Great Loop. “We are in the beginning stages of finishing the house remodeling, and then we will sell everything and leave the land,” Anderson says. To date, the Andersons are on track with their plan for the Great Loop. 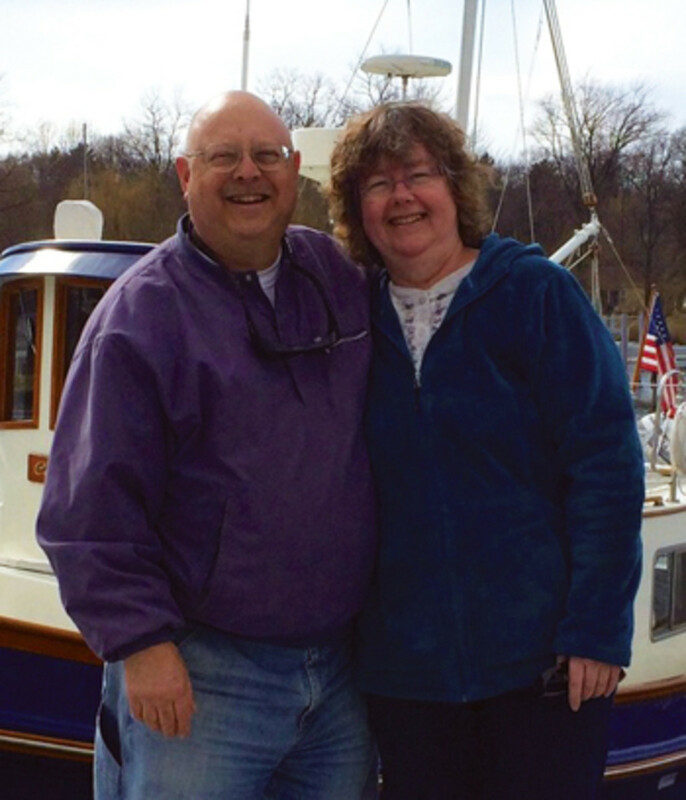 “We know of other couples that are, were liveaboards on their tug, so we know it is possible. I believe she will fulfill her mission admirably,” Anderson says. And he’s sure they have the right boat. “Everything is just better on a tug,” he says. 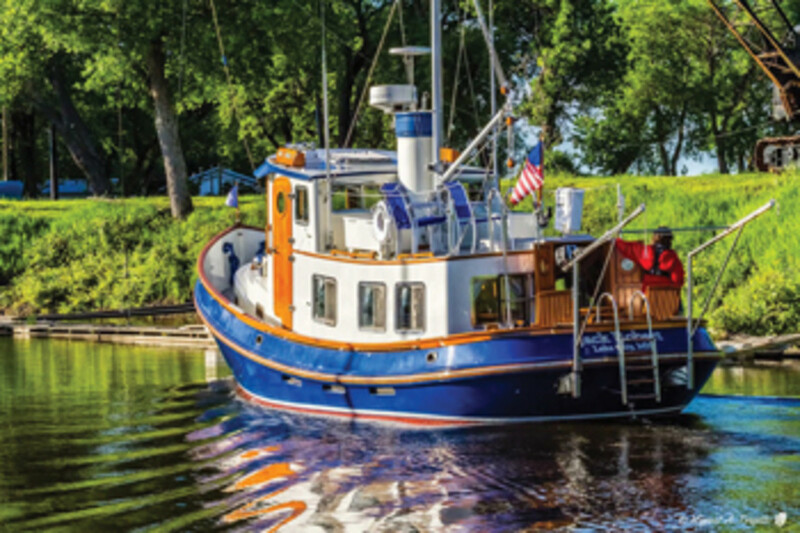 The PowerBoat Guide calls the Lord Nelson Victory Tug a “popular coastal cruiser” with a “bold, workboat profile … secure, built to last.” The interior revolves around a single-stateroom layout. Although deck plans changed during the production run, the stateroom was forward, with an offset berth for two and hanging closet space. The adjacent head compartment had a marine head, sink and vanity, and shower. The U-shaped galley had a stovetop, refrigerator and double sink with pressure water. On some versions the galley was placed to port, to starboard on others. The helm station had room for electronics, with good sightlines behind the five-panel windshield. A side door accessed the deck. The saloon was an open area, well lighted by windows all around. The profile was all tugboat: tall bow, curved wheelhouse, smokestack and steadying-sail mast to add to the look. 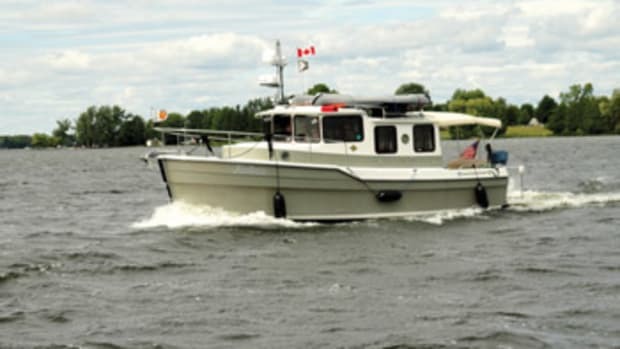 The single diesel could be accessed by a walk-in galley door or pilothouse hatches. With its plentiful fuel supply, the LNVT had a range of 800 to 900 miles at trawler speeds. The Lord Nelson Victory Tug went into production in 1982, capturing the growing wave of excitement about trawler-style boats. Around 75 were built during an eight-year production run. 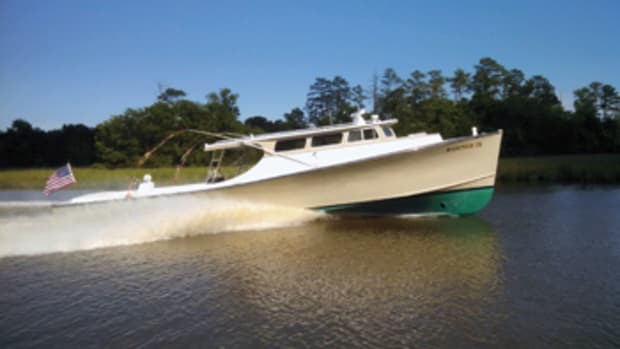 Although the company is no longer in business, the 37-foot LNVT remains popular with the tug/trawler crowd a quarter-century after the last one came off the production line. This article originally appeared in the April 2017 issue. So many boats, so many ways to get out on the water. 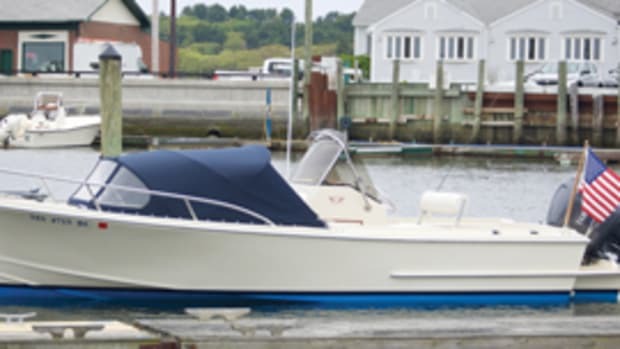 For Allan and Sally Seymour, it was trailer-boating with a 19-foot Boston Whaler, covering the East Coast from New England to Norfolk, Virginia.